The Sun is the principal source of energy input to biological systems. 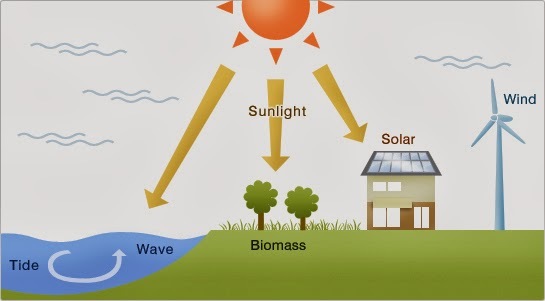 The Earth receives 2 main types of energy from the Sun: light (solar) and heat. Photosynthetic plants and some bacteria can trap light energy and convert it into chemical energy. Heterotrophic organisms obtain their energy by eating plants or animals that have eaten plants. So all organisms, directly or indirectly, get their energy from the Sun. The energy is passed from one organism to another in a food chain but, unlike water and elements such as carbon and nitrogen, energy does not return in a cycle. Energy give out by organisms is lost to the environment. 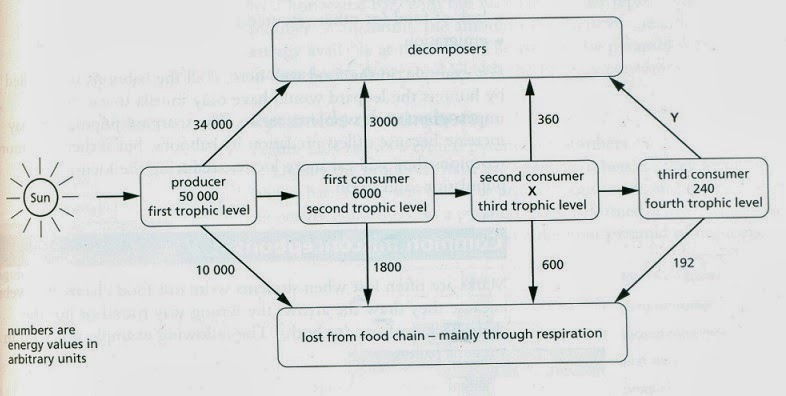 Energy is lost at each level in the food chain, as in the examples below. Energy used up for movement (to search for food, find a mate, escape from predators…). Warm-blood animals (birds and mammals) maintain a standard blood temperature – they lose heat to the environment. Warm-blood animals lose heat energy in faeces and urine. Some of the material in the organism being eaten is not used by the consumer, for example a locust does not eat the roots of maize, and some of the parts eaten are not digestible. does not fall on the leaves. On average, about 90% of the energy is lost at each level in a food chain. This means that in long food chains, very little of the energy entering the chain through the producer is available to the top carnivore. So there tend to be small numbers of top carnivores. The food chain below shows how energy reduces through the chain. It is based on maize obtaining 100 units of energy. On shorter food chains, less energy is lost. 3. a) The consumer may be warm-blooded, so some energy is lost as heat. Consumers usually move around to find food, a mate, or escape from predators, which uses up energy, but producers do not move. b) Feeding as a first consumer involves eating plants. Less energy is lost to the environment when feeding at this level, so food production is more efficient in terms of energy conservation.